Browse our range of orange copy paper today for a stunning, vibrant and vivid orange that truly stands out. Whether you’re in need of orange printer paper for organisational purposes at the office or are looking to add to your craft supplies, our selection of orange sheets are perfect for any use. 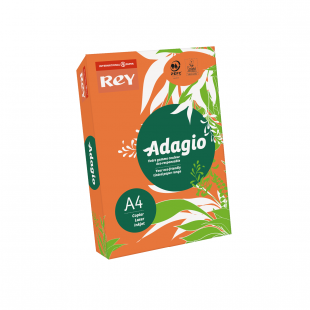 Available in packs of 250 or 500 sheets, our current stock of A3 and A4 orange printer paper are suitable for all purposes, including brochures, paperwork dividers and leaflets. 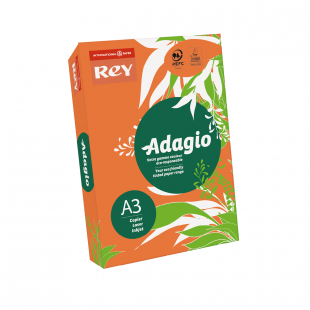 As the paper in this range is manufactured by Rey Adagio, a brand certified by PEFC™, FSC®, EU Ecolabel and ISO 9706, we can guarantee that these orange copy paper sheets are produced from sustainable forests. In addition to the wide range of purposes for both educational and office use, you will also be able to take advantage of their compatibility with both inkjet and laser printing, allowing you to achieve flawless printing results using our orange printer paper. With many dyslexics having benefitted from reading on coloured paper, these orange sheets are well-suited for use in education as well as other professional environments. Whether it’s for notes, worksheets or for any other purpose, take advantage of ordering your orange copy paper today. If you would like to know more information regarding one of our orange paper reams, please get in touch with us today. You can call us on 01539 735 252 or fill out and submit your enquiry using our online contact form. You may also be interested in taking a look at our other craft supplies, as well as our extensive collection of envelopes, including our square peel and seal envelopes in pumpkin orange, a perfect complement to your purchase of our orange copy paper.